A crappy phonecam pic of the soup is better than no pic at all, right? Cut up the potatoes, in a lot of different sizes and add them early, when the water starts to boil. The big ones will be chucks in the soup, but the small bits will cook in, making the broth thicker and richer. Leave on skins- they are flavorful and nutritious. Sauteed ingredients: (I like to saute soup ingredients, it adds a lot to the flavor, and this was no exception.) Sweat or saute onions in clarified butter, and when they’re close to done, add garlic. Add these first. Slice the yam thinly and sauteed it in the remaining butter. Set aside. Peel and slice the parsnips at an angle, saute and set aside. Salt and pepper to taste. Eat. 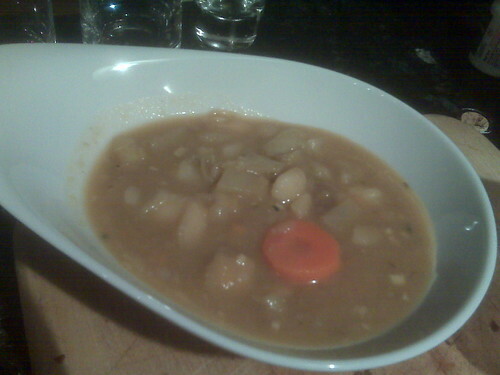 This entry was posted in food and tagged cooking, soup on December 4, 2009 by quinn.